I must have passed the statue several times. I remember glancing at it absent-mindedly during short waits at the Singanallur signal. But I went back to it and spent a full 10, minutes before it, after reading Nanjil Nadan’s Soodiya Poo Soodarka. Clad in dhoti and kurta with a thudu thrown over his shoulders, yesteryear trade union leader N.G. Ramasamy stood tall, amid the din of traffic. The Gandhian had refused to identify his assailants, even on his deathbed. I learnt of this in Soodiya Poo Soodarka, an outstanding anthology of short stories, that won Nanjil Nadan this year’s Sahitya Akademi Award. Nanjil Nadan has six novels, 112 short-stories and two poetry collections to his credit. In the recent years, the writer has shown a special interest in essays that reveal his social-consciousness and thirst to do his bit for the society. Born as G. Subramaniam in the small town of Veeranarayana Mangalam, Kanyakumari district, Nanjil Nadan has been a prominent figure in Tamil literature for the past 35 years. After completing an M. Sc in Mathematics, he left for Mumbai in 1972 to work in a private company. Mumbai presented a cultural shock to the lad from the south. Yearning for the familiar, he spent evenings at a Tamil Sangam, reading for hours on end. “I read and read – at the bus stand, at the railway station, where ever possible. I remember reading two books a day. Lonely in an alien world, my eyes used to well up at the thought of home. 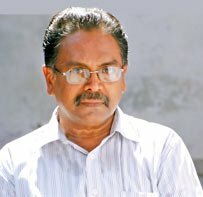 Every time I was nostalgic, I headed to Victoria Terminus (now Chatrapati Shivaji Terminus) to watch passengers on Chennai-bound trains – it was the closest I could get to home.” It was during this period that Nanjil Nadan penned his first short-story, Viradham, which was published in writer N. Parthasarathy’s magazine, Deepam. “I was thrilled to see my name in print for the first time. I bought several copies to flaunt to my friends and colleagues,” reminisces the writer. Around the same time, Nanjil Nadan started work on his first novel, Thalaikeezh Vigithangal. Published in 1977, the novel was an instant best-seller. Years later, it was adapted in to a movie ‘Solla marandha kadhai.’Later came novels such as Enbiladanai veyilkayum, Mamisapadaippu, Midhavai, Sadhuranga Kuthirai and Ettuthikkum madhayaanai. Every written work of Nanjil Nadan bears a fascinating title. A few of them even have references from Sangam literature. In fact, an M. Phil student has done a research on the titles of the writer’s works. 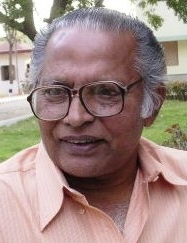 Velayutham was instrumental in bringing about the publication of Sadhuranga Kuthirai in 1993, Nanjil Nadan’s first novel since his move to Coimbatore in 1989. Nanjil uses essays as a medium to raise his voice against the injustices faced by the voiceless. His essay Idhu pengal pakkam, about the unsanitary conditions of toilets in all-girls schools of Tamil Nadu created quite a stir when it was published in Anandha Vikatan in 2009. The writer’s books are also part of the curriculum in schools and colleges. “Nanjil’s description of food will have your stomach grumbling,” smiles the writer’s close friend Venil Krishnamoorthy of Nandhini Pathippagam. Be it a potato sabji garnished with green chillies and onions or a simple kanji served in a coconut shell, the writer can make food as appealing as possible. “It’s my way of making things interesting for the reader,” says Nanjil. “Eating is an experience I absolutely enjoy.” In fact, he is currently working on a book about the cuisine of Nanjil Nadu. 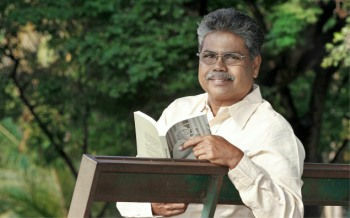 The author has also forayed into the online world – he periodically contributes essays to solvanam.com. As a sales executive, Nanjil Nadan has travelled widely across the length and breadth of the country. The many interesting people he met during these travels have found their way in to his stories. As we wind up the interview, he tells me about one of them. It was a hungry farmer he met during a train journey in North India. “I was having lunch when this shrivelled old man walked into the compartment. Noticing the last few bits of roti in my plate, he said imploringly, ‘ Hami kaanaar! Hami kaanaar!’ I was taken aback. He did not ask to be fed; he just said, ‘Let us eat.’” Read about this encounter in Yaam Unbaem, another story in Soodiya Poo Soodarka. This entry was posted in அனைத்தும், சாகித்ய அகாதமி, நாஞ்சில்நாடனைப் பற்றி and tagged சாகித்ய அகாதமி, நாஞ்சில் நாடன், நாஞ்சில் நாடன் பேட்டி, நாஞ்சில்நாடனைப் பற்றி, நாஞ்சில்நாடன், நாஞ்சில்நாடன் கருத்துகள், naanjil nadan, naanjilnadan, nanjil nadan, nanjilnadan, sisulthan. Bookmark the permalink.